We have a technically advanced and dedicated forging facility, a full-fledged shop floor, machining facility and a forging bay spread across 45, 000 square feet. 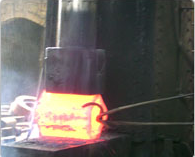 Our in-house facilities include Heat Treatment and Proof Machining, where Hardness, Mechanical, Impact, Chemical and Ultrasonic testing are facilitated. We have a technically advanced and dedicated forging facility, a full-fledged shop floor, machining facility and a forging bay spread across 45,000 square feet. Our in-house facilities include Heat Treatment and Proof Machining, where Hardness, Mechanical, Impact, Chemical and Ultrasonic testing are facilitated. There are three clear space Pneumatic Open Die Forging Hammers of 500, 750 and 1000 kilogram capacities and Close Die Forging Hammers of 2000 kilogram capacities. They are aided by four fully automatic Bi-Metal Band Saws, for cutting raw material and a well-designed oil-fired furnace with a captive power generating unit. Heavy-duty all-geared lathes ensure that products are further processed to a semi-machined condition, where they are flawless, before being dispatched. Equipped with technical know – how and an innovative approach to business management, we have created the edifice of our achievements on the platforms of quality, utility, durability and design in the field of valves. We have our own CNC machining facilities and design facilities support by team of young engineers. We aim to become an undisputed leader of valve industry armed with quality product and supported by efficient services and on – time delivery.